Joseph adapted quickly to the demands of our strength/stamina focused training programme. 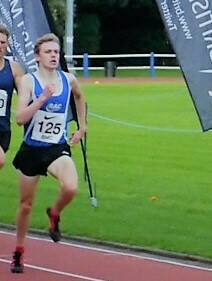 He recorded a highly promising ParkRun 5K time of 16-09 in December 2016, and achieved a highly respectable 12th place finish (U20M) at the Midland Counties XC Championships in January 2017. A few races on the Winter Indoor circuit saw Joseph take the Midlands Indoor 800m title, and improve his 800m best to 1-52.04. On the back of these performances, Joseph secured his first England vest, winning on his international debut at the Welsh Athletics Indoor international. Victory in the 1500m A race (3-55.36) at the BMC Academy meeting in Milton Keynes in June. Qualification for the England Athletics U20M 1500m final (3-53.84) in June. A narrow loss to a current England Senior Steeplechase International in the Tim Wealthall Mile race (4-15.3) in late August. 1-51.94 (800m); 3-52.57 (1500m); 4-15.3 (Mile); & 8-46.3 (3000m). All these times were ranked in the top 5 2017 East Midlands U20M performances, with the 800m & Mile time topping those rankings. From October 2017 Joseph will be studying at the University of Birmingham.